The Gem & Jewellery Export Promotion Council of India (GJEPC), inaugurated the 6th edition of â€œIndia Gemstone Weekâ€ in Jaipur on April 11. 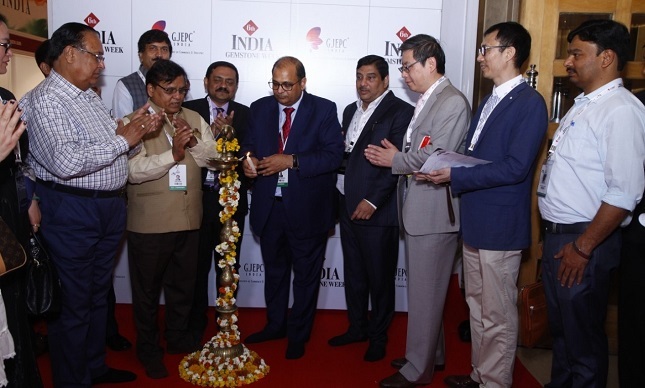 The event was inaugurated by Mr. Pramod Kumar Agrawal, Chairman, GJEPC; Nirmal Bardia, Regional Chairman; Vijay Kedia, Co-convener of the Coloured Gemstone Panel; Sabyasachi Ray, Executive Director, along with International buyers and exhibitors from India. Pramod Agrawal said: "The Indian colored gemstone industry has been one of the finest cutting centre for precious and semi-precious gemstones. This industry has been here for more than 300 years now and currently 300,000 people are directly involved in the gemstone business. Indiaâ€™s exports of colored gemstones accounted for US$421.73 million in 2018 as compared to US$420.79 million in 2017. GJEPC is constantly working to boost the exports by exploring new markets. We are also developing this sector by providing better infrastructure, skill upgradation, creating opportunity to meet international buyers through platforms like India Gemstone week. In order to sustain rough supply for manufacturing, GJEPC is organizing BSM with mining companies of various Mining destinations across the globe. Our efforts would be to create employment in the sector and improve its contribution to the economy." "India Gemstone Week is an ideal opportunity to showcase Indiaâ€™s strength and capabilities in manufacturing world-class cut and polished gemstones. For buyers, it will be an opportunity to meet manufacturers for sourcing gemstones, understand supply chain, business practices and culture," Agrawal added.